There was a sudden silence, as everyone tried to comprehend what that means. We couldn’t believe it. But, as it turns out, there are many rules like the one above in this programming course. And nearly every rule is highly debatable if not plain wrong (in our perception). There is no problem with the presentation of certain rules in a beginner’s programming course. Novices need clear and precise rules to learn, according to the Dreyfus Model of Skill Acquisition. The concept just doesn’t work for students that aren’t on the Novices level anymore. These students are explicitely forbidden to create more advanced solutions. They are discouraged to look into different programming styles because it will only harm their grades. We can think of a possible explanation for this scenario: The assignments have to be evaluated by the course instructors. It takes a lot of hard work (and time) to evaluate hundreds of totally different solutions for the same problem. If the solutions are mostly similar in style and concepts, the evaluation is a lot easier and can be done without full understanding of the code. This is a rather poor explanation. It says “don’t be too advanced in your field of study or you will be too troublesome to attend to”. This is essentially an anesthetization by decree. But the real problem arises when you realize that there won’t be any continuative programming courses. They will never teach you all the more advanced concepts or rectify the silly rules that should get you along as a beginner. After you’ve successfully mastered this course, the studying focusses on the more academic topics of our field. The next possibility to develop your programming skills in a professional setting is your first software development job. We don’t have a practical solution to this problem. One obvious solution would be to have more instructors evaluate less assignment solutions in the same time, enabling them to dive deeper in the code and give better personalized feedback. This scenario lacks at least enough capable instructors. The reality shows that Novices level students (in the sense of the Dreyfus Model) are often taught by Advanced Beginner level instructors (called a “tutor”). But we have a word of encouragement for all you students out there, feeling dumbed down by your instructors: It’s not your fault! 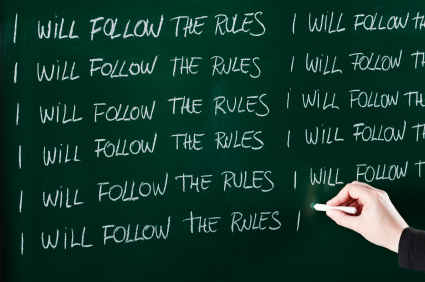 Take your programming course rules with a (big) grain of salt and talk to other developers. If you don’t know anybody already in the industry, try to make contact with some fellow open source developer on the web. It’s really just the advice “Find a Mentor” from the book Apprenticeship Patterns (highly recommended for aspiring software developers) applied in real life. Because if you don’t actively unlearn all these arbitrary rules or at least put them into perspective, you’ll start your professional developer career with the burden of some really antic code quirks. Good luck and tell us your story, if you want.